JANE: We’ve been talking about the close connection between folk and rock. It would probably shock those who are familiar with David Bowie as the wildly-costumed, makeup-wearing glam rocker to realize that many of his earlier songs were solidly folk. ALAN: I didn’t know that. Tell me more! JANE: Once it’s pointed out, the relationship is obvious. “Changes,” which appeared on the album Hunky Dory, sounds very much like something Bob Dylan might have written. In case anyone might miss the influence, the “B” side of the album includes the ironical “Song for Bob Dylan” which begins with a salutation to “Robert Zimmerman” – which was Bob Dylan’s actual name. ALAN: I know the song “Changes” but I’ve never heard of the album. But from what you say, the influences are clearly there. JANE: It’s a good album. You might want to try it. As I mentioned, the songs on Starting Point show both the influence of folk and the British music hall tradition. Bowie’s next piece to get widespread recognition, “Space Oddity,” begins with a very folkie strummed guitar. 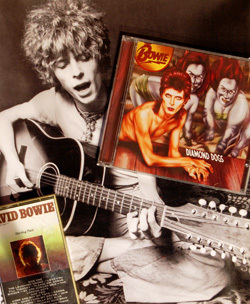 Interestingly, despite the song’s folk roots, Major Tom would begin Bowie’s journey away from folk and into rock – though it would not be a clear break. The album Space Oddity is very folk-influenced, and the album I mentioned above, Hunky Dory, post-dates this transition. ALAN: Trickster is a very good word. I think it sums him up well – you never really know what he’s thinking. He looks at the world in an odd way. But whatever is on his mind will generally turn out to be clever, and often quite funny as well. JANE: Agreed! One of the things I love about Bowie’s work is the same transitions and changes that seem to (at least based on my reading) annoy both many of his fans and music critics alike, all of whom want him to stay in one place, one time. This isn’t to say I like each stage equally, but I respect Bowie as an artist who will not let himself get stuck. And, one element remains a constant… Want to guess what? ALAN: Bowie reinvented himself so many times that I’m not really sure what you mean by this. Surrealism, perhaps? JANE: Close, but not quite… The unifying element is science fiction… Early on there was the futuristic dystopia of “London Boys” – a theme that would be picked up in the later Orwellian album Diamond Dogs and in many of the songs in his three Berlin albums. The title of one of Bowie’s albums, The Man Who Sold the World, seems a clear allusion to Heinlein’s story, “The Man Who Sold the Moon.” Bowie was considered to play the part of Valentine Michael Smith in Heinlein’s novel Stranger in a Strange Land, so I don’t think it’s a stretch to assume he was familiar with Heinlein’s work. Major Tom from “Space Oddity” resurfaces in “Ashes to Ashes.” Ziggy Stardust – the persona even non-Bowie fans have heard of – is a space alien and the albums from those years are full of SF references. ALAN: Oh! Of course. Silly me. There’s a lovely scene in the movie of Ziggy Stardust’s last performance where Bowie is in the dressing room putting on his Ziggy persona, ready to go on stage. His (then) wife Angie is fussing around helping him. Eventually Bowie sends her away and turns back to his mirror. “What do women know about makeup?” he mutters to himself. I love many of his songs, but it’s his personality that really appeals to me. All his interviews (except the early, incoherent ones where he’d ingested so many drugs that he wasn’t really there) show a delightful sense of humour and a charming ability to laugh at himself. The makeup comment is absolutely typical. I saw him in concert a decade or so ago and, while I enjoyed the songs a lot, I also found the informality and humour of his performance irresistible. JANE: You’ve seen him in concert? I envy you… I was always either too poor or too far away, so I’ve missed that pleasure. My sister, Susan, did give me her program from the “Glass Spiders” tour. It’s one of my treasures. ALAN: I don’t normally go to concerts because I hate crowds – I get claustrophobic and I have anxiety attacks. But hey! This was David Bowie. It was an open air show and, of course, it was pouring down with rain. The backing band was huddled under an awning, but Bowie was prancing about on a proscenium that stretched out into the crowd, and despite the weather, he was obviously enjoying himself hugely, laughing and joking between songs. They shook their heads and stayed under their awning. At the end of one song, someone brought him a large towel. He stretched it out and pretended to strum it like a guitar. “Oh, look,” he said. “It’s an air towel.” Then he rubbed it over his soaking wet hair. “Now it’s a hair towel!” He laughed hugely. “Glass Spiders” starts like a story, “Up until one century ago…” The concert (I do have the video) was full of SF images blended into surrealism. ALAN: And of course he isn’t the only musician with an SF interest. Perhaps we can explore that next time? This entry was posted on December 4, 2014 at 1:00 am and is filed under Thursday Tangents. You can follow any responses to this entry through the RSS 2.0 feed. You can leave a response, or trackback from your own site. Didn’t know Bowie was so SFnal-oriented. I remember he was in “The Man Who Fell to Earth” many years ago. I haven’t ever seen that movie, believe it or not! However, Bowie’s performance in the non-SF, historical film MERRY CHRISTMAS, MISTER LAWRENCE is brilliant. The story is set in a prison camp, so it’s not exactly a cheerful watch, but each of the actors playing the four main roles does an excellent job.